Be the first to share your favorite memory, photo or story of Delores. This memorial page is dedicated for family, friends and future generations to celebrate the life of their loved one. Delores Ann (Gerner) Lantz was born in Clinton, Oklahoma to Reinhold Julius “R.J.” and Opal Claire (Stewart) Gerner on July 29, 1937. She passed at the age of 81 on March 30, 2019, surrounded by her family. Delores started her career working as the Executive Secretary for Dale Carnegie, author of How to win Friends and Influence People, which led to a love of reading self-help books. She then went on to own and operate her own business, A.C. Personnel, for twenty years before selling the business and retiring. Finding that she wasn’t very good at sitting still, she went to work for AT&T at the age of 60, working as a Quality Analyst in their customer service department for ten years before retiring for a second time. Delores was kind and giving, and was known by her grandkids for her $20 handshakes and hugs. 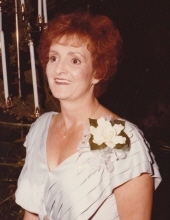 She took great pleasure in shopping for her family, especially her grandchildren, and she never missed an opportunity to attend the grandkids’ sporting events. In her spare time Delores enjoyed going to the casino, traveling, especially to Tuscaloosa, Alabama, and of course reading those self-help books. Delores was preceded in death by her parents and siblings Carolyn Roelen and Ronal Gerner. She is survived by: Daughters Diane McCollom and husband Steve of Oklahoma City and Sheri Zebert and husband Terry of Yukon, Oklahoma; five grandchildren: Dustin McCollom and wife Misha, Chad McCollom and wife Monica, Terrin Zebert, Donald “Donnie” Gardner, and Kristina Gardner; five great-grandchildren: Nevaeh Hennessey, Lily McCollom, John McCollom, Kimber McCollom, and Asher McCollom; and a host of extended family and friends. Her family will be present to receive friends from 6:00 pm to 8:00 pm on Wednesday, April 3rd at Yanda & Son Funeral Home in Yukon (1500 W. Vandament Ave). A celebration of Delores’ life will be held at 10:00 am on Thursday, April 4th at Yanda & Son, with entombment following at the Resthaven Memory Gardens Mausoleum in Oklahoma City (500 SW 104th St). Flowers may be sent to Yanda & Son on Wednesday, or contributions in Delores’ memory may be made to the Alzheimer’s Association (alz.org/donate). To plant a tree in memory of Delores A. (Gerner) Lantz, please visit our Tribute Store. "Email Address" would like to share the life celebration of Delores A. (Gerner) Lantz. Click on the "link" to go to share a favorite memory or leave a condolence message for the family.